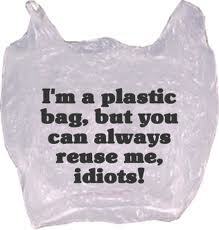 Newspapers today are reporting that Rob Ford has plans to get rid of the plastic bag fee. This bylaw which came into effect on June 1, 2009, requires all retailers in Toronto to charge a nickel for every single-use plastic retail shopping bag. Toronto was apparently the first Canadian city to pass such a law with the goal of reducing the amount of plastic being sent to landfills. The original bylaw made no provisions for controlling what was done with the fees collected other than encouraging stores to spend the money on environmental or community initiatives. Nobody has any stats on what becomes of the 5 cents but it is thought to be kept for the most part by retailers. However, the CBC has reported that a number of grocery stores such as the Metro and Sobey's chains have said their plastic bag distribution rates have fallen between 70 and 80 per cent since the bylaw went into effect. The CBC also reported that impetus for eliminating the bag tax, as per a spokesperson for the mayor, was that people are supposedly "sick of being nickel and dimed to death" and Mr. Ford would like to do something about this. Fourteen U.S. communities, including San Jose, Calif., and Los Angeles County, have now passed plastic bans. They include the counties of Kauai and Maui in Hawaii, whose bag bans go into effect Jan. 1. Westport, Conn.; Edmonds, Wash., and the Alaska towns of Hooper Bay and Bethel have plastic bag bans. The Outer Banks, N.C., counties of Hyde, Dare and Currituck also have a ban on plastic bags, enacted as a single measure for those three counties. In October, Telluride, Colo., passed a plastic bag ban that goes into effect March 1 and also requires retailers to charge 10 cents for paper bags. In addition, Washington, D.C., has had a 5-cent tax on plastic and paper bags at checkout since Jan. 1. A $1 fee on carryout plastic bags goes into effect on Jan. 5 in Brownsville, Texas, the location of a major paper bag manufacturing plant. As we arrive at the end of 2010 and the end of a tumultuous last quarter which saw us vote into power Mr. Ford, I see yet another sign that our mayor has an eye out for the little guy. The little guy said waiting in his car behind a stopped streetcar was a pain, so Rob Ford vowed to get rid of streetcars and replace them with buses. The little guy says 5 cents for a plastic bag is a pain so Rob Ford vows to get rid of it. As for the streetcar issue, I think I covered off how the numbers didn't quite add up in my blog Rob Ford: Day#1, Promise #1? Mr. Ford's comparison between streetcars and buses is flawed and I'm saying this as somebody who lived right smack in the downtown core for years. As for the plastic bags, I can say from experience that the charge, although only five cents, made me finally get my act together and start doing what I should have been doing for years: carrying my own cloth bag and reusing it instead of getting more and more and more and more plastic bags. That has been admittedly a sin on my part and I am now trying to atone for it. Hail Mary. Unfortunately if Mr. Ford does listen to the little guy and eliminate the plastic bag tax, he may be putting 5 cents into our pockets but misses the bigger picture. Yes, a better written bylaw would have ensured the 5 cents collected by retailers was not just pocketed but spent on community initiatives. The important point, the really, really important point is what the CBC reported: a number of grocery stores such as the Metro and Sobey's chains have said their plastic bag distribution rates have fallen between 70 and 80 per cent since the bylaw went into effect. Think about that: a drop of 70 and 80 per cent in plastic bags being handed out to customers. That is enormous! Answers.Com says it may take a thousand years for a plastic bag to biodegrade or disintegrate. At some point we as a society have to consider the greater good, not the little guy's complaint about 5 cents. For him, it is a question of a single plastic bag, for us as a group it's a question of zillions of plastic bags. I do not think having a cloth bag around to reuse it for carrying purchases is a big deal. And those times when I goof up and forget to have a bag with me, well, I accept my punishment and fork over the 5 cents. Heck, I'm lucky; we're lucky. In the list of other cites doing this from PlasticNews.Com, I see Telluride, Colorado is going to charge 10 cents per bag starting on March 1, 2011 and on January 5, Brownsville, Texas will charge $1 per bag!